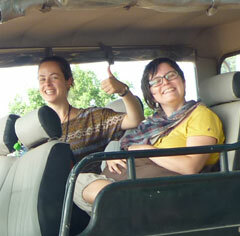 Welcome to Janaka Safari Jeep Tours! We are three brothers team who have more than 11 years experience in providing safari services to the visitors of Yala National Park, in Sri Lanka. We are specialist to do safari in Yala National Park in Sri Lanka. We have been doing safari since 2002. We have luxury 4 x 4 drive jeeps. Our aim is to show you the leopards during your tour to Yala. That is our main purpose. Yala National Park has one of the highest densities of leopards, anywhere in the world. The leopard is also the top predator on the island. This lends it an air of confidence, which together with the open nature of the park's terrain, allows Leopard watching. We are Sri Lankan Yala Safaris team lead by Safari Janaka who has been doing safari for more than eleven years in Yala National Park in Sri Lanka. There are many other animals living inside yala national park where you could see with Sri Lanka Yala Safaris. Snakes, Beetles, aquatic Beings and many kinds of birds. We are Janaka safari jeep tours team lead by Safari Janaka who has been doing safari for more than eleven years in Yala National Park in Sri Lanka.